Whether it’s inspiration you seek or innovation you crave, we can help inspire your “Creative Spirit” with the right designer drapery hardware at Houston Blinds For Less. 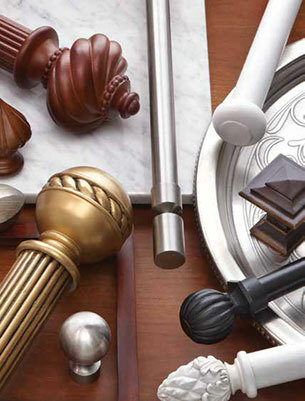 From an Elegant line of Opulence collection to the boldness of the Iron Rods, to a modern sleekness of the Finesse collection and other traditional collections, Houston Blinds for Less Design Consultants offer a wide variety of creative and designer drapery hardware collections to fit any style. With custom crafted hardware that is hand finished in the United States the Opulence collection elegantly enhances any deco with classic finial styles in twelve rich finishes. Offering the perfect blend of custom quality and functional style, this hand finished collection with smooth and reeded pole style comes in three different diameters and is available in custom widths. It’s the perfect treatment allowing for a truly distinctive look in every window. With the enduring look of hand forged iron, this incredible look in classic style engages handsomely with a wide range of decors. This collection offers six finishes, custom width, and offers bay window and corner applications. It’s Bold yet delicate, this select line of drapery rods offers our clients modern finishes in custom widths for simple contemporary elegance. Available as inside, outside or even ceiling mounts. Along with our traditional collections of Curtain Rods, Conventional Traverse Rods, and Adjustable Poles, choose from drapery hooks, tassels, cleats and finials. We have a variety of materials and styles available to complement any décor. Houston Blinds For Less also offers an excellent selection of beautiful window drapes to begin your window treatment design, as well as matching window top treatments. Contact us now to learn more about how you can add more individuality and personal style to your home or office with window treatments and designer drapery hardware from Houston Blinds For Less.